This painting is now finished. It has taken a long time. The photo doesn't really do it justice as I have added lots of sparkles which don't seem to show up very well. I am glad it is done but now it is on to the next project. I am still not decided what my Christmas card will be this year. I have had a few ideas but then they sort of fizzled out. When the right one finds me I will know. Skyping with Donna was an amazing experience. I was able to see and hear the whole show.Donna, Lauren and I were able to chat and laugh at Graham Norton together. Donna said it was as if I were in the room. I don't know if that was a good or bad thing, but everyone seemed happy. All except the contestants that is.........ye gods there were some miserable songs this year. There was a distinct lack of weirdos too. But, as I have said before, it is not about the songs or the competition. It is about us laughing at the rest of Europe taking this nonsense seriously while we couldn't give a hoot about where we come. As it was, we were not far from being last. I think we had 5 points but then France only 4 points and I believe Germany and Austria (the host nation no less) got bugger all. Now if you can't see how funny that is then you had better go and sing a long with one of the miseries in the show. I know I have banged on about the health care here versus the NHS once or twice before but seriously.....look after your health service. If you remember my friend had a slight stroke a couple of months ago. Today I was helping her order the prescriptions that she now needs...blood thinners, heart medications etc. At the end of the phone call she asked how much this delivery would be........$1010. Yes...over a thousand dollars for prescriptions. In the UK, as she is disabled, she wouldn't pay anything. She then told me the bill for her 6 day stay in the hospital, bearing in mind there were no surgeries just a couple of scans, most of the time it was just monitoring her and helping her get around. The bill for the 6 days came to $92,000. Yep 92 thousand dollars.....with no surgery or intensive care. Keep your health service safe. 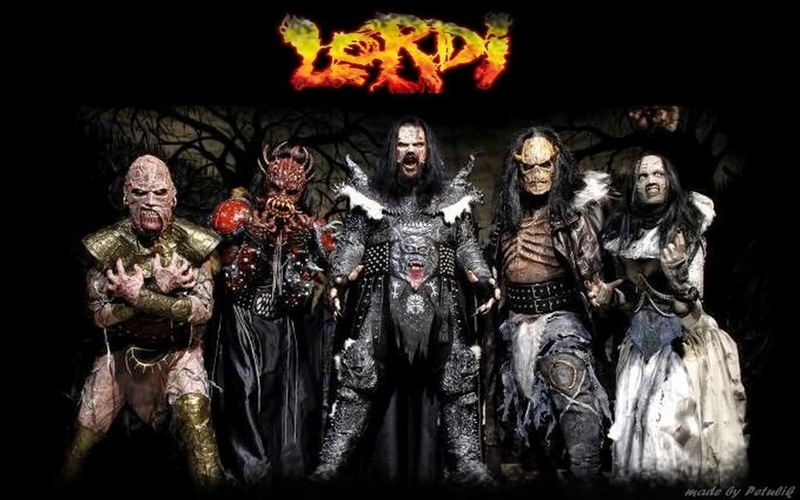 Previous Eurovision Entry by some nation...who knows now? 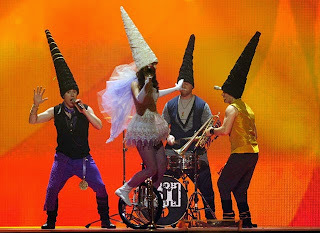 Donna told me that it is the Eurovision Song Contest this Saturday. Oh pants. I can't get to see it over here. I can see the contestants on the internet but I can't see our British version of the show with Graham Norton's commentary. It is Graham Norton ( and before him, Terry Wogan ) and his witty remarks, that make the show. My friends here would have no understanding of the way most of us Brits view this contest. We don't bloody care if we win. I personally hope we get no points at all. That is always funny. We watch it knowing we don't stand a chance because European chums all vote for each other and take it far too seriously. It is in that vein that Graham Norton talks about our and the other entries. Oh dear....I don't think there is an American term for that......ermmmm.....he pokes fun. That is the closest I can find. And my goodness the contestants supply plenty of ammunition for fun poking. Donna tells me that Australia is taking part this year. They have the same sense of humour as we do. I am hoping for great things, from their song, singer and especially from their commentators. When you look at the pictures of previous contestants, it is little wonder that the rest of the world doesn't get it. I am not sure these contestants get it. How can these countries take themselves seriously when they pull things like these out of the hat. Last one as people will think I am making it up. Anyway, I am mega excited now. Donna had an epiphany. We are going to Skype while the show is on. She will point her laptop at the telly so I can see and hear what is going on. We will watch it together. A sort of cross Atlantic Eurovision Party. I shall get booze and nibbles. I haven't seen any of the previews so it will be a big surprise. I wonder if we will win? I don't really. I hope we tie with Australia for last place. 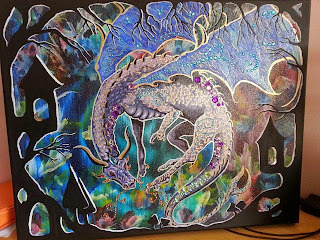 Kaleidoscope Dragon is very nearly finished. I want to add some jewels to him just to give him a bit more pazazz, but hopefully he will be totally finished then. He has taken a long while to do. So many stages. So, now it will be on to the Christmas card...........no idea what I will do this year. Still working on the dragon. I am glad I have been taking photos at various stages. It helps me to remember just how much work I put into these things. I think I will change his eyes. Green doesn't look mean enough for a dragon so I think I will change them to red. Then I will have to try to back off the actual dragon and start working on the border and foreground. If I don't leave him alone soon I will over work it. It is just that every time I pass him by, I notice another little thing that I could improve. I really would like to start working on my Christmas Card painting soon too. I have only a vague idea of what I would like to do for this year but that will probably change as soon as I start sketching. I am still bimbling around making jewellery. It is a little glass ball with a sprig of lavender inside. I can't do very many at any one time because my hands don't always work properly. They hurt most of the time but some days are better than others. I have to choose a good day or most of my beads, and teeny, weeny little jump rings fly off and hide on the kitchen floor. Tomorrow I hope to trundle off to the mall. Stay tuned to find out what delights the 'idiot magnet' has in store for me. Here is Philip having some fun.........not. 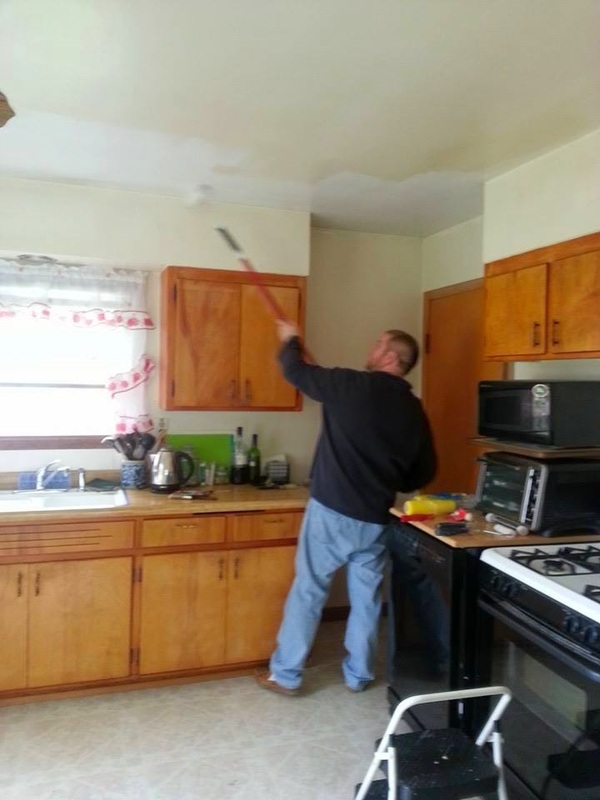 He spent Saturday afternoon painting the kitchen ceiling. We would really love a complete, new kitchen but bank account says.....nooooooooo...so we are settling for a new coat of paint. He will probably do the walls next weekend. One lump of painting in a weekend is enough for him. He made a good job of it although he did need his "special mug" from time to time. This mug is reserved for those times when he is under considerable stress. Such as playing Star Wars Online and painting. Sunday was Mother's Day over here. Cards from both offspring, the cats and Philip. I also got a new garden gnome and a couple of charms for my Pandora bracelet. We decided to chance going out for brekkie and, as expected, the restaurant was very busy with mums and families intent on showing their love. The table next to ours had, what looked like, a complete family seated around it. Nan and Granddad, grown daughter and son in law, and their son. So, two mums and families..........ahhhhhhhhh. All seemed to be going rather well until they were sitting chatting after their meal. Unfortunately I couldn't hear what they were saying but suddenly the grown daughter leapt to her feet and announced loudly that she had heard enough of his bullsh*t and was leaving. This was directed at the old man who was, apparently her dad. He looked a miserable old sod to be honest. She then got up and went around the table and hugged her mum, the Nan, who looked so fed up. She leant across to her dad and told him he always goes too far. He had a nasty expression on his face. With that, she left and her husband and son followed her out. The poor Nan looked so miserable. She said nothing to the Granddad. I really felt sorry for her. It looked like she was used to him spoiling family occasions. I wonder what he gets out of ruining such a nice outing. I also wish I knew what it was he said. I will never know. There are some mean people about. Sally continues to keep me amused. Someone, I can't say friend although she is on my friends list I have never met her, got all bent out of shape on facebook today. She is someone who is a member of a group I belong to. I have noticed before that she seems to like a bit of drama so I don't think she is someone I would be friends with usually. I shall let it all die down for a few days and then I shall quietly drop her off my list. I don't need any more drama. Started the second week of my Middle Ages course today. I am still liking it even though the rather nice young man has been changed for an ok lady. Oh...she is alright really. At least I paid more attention to the lectures. Firstly, the little yellow birds are back. This is a true sign of Spring around here. These little chaps are so pretty and look....the tree has leaves too !!! I have started another online course. This one is run by the Barcelona University. It is ....Magic in the Middle Ages. So, far I am enjoying it. The lectures have been very interesting and enlightening. I didn't know as much about the Middle Ages as I thought I did. The lecturer is rather dishy too. Which, can be a hindrance as well as a help. I pay attention to him because he is a hunk then I find I haven't heard the last couple of sentences because he is a hunk. Oh well, I am sure there will be other lecturers involved who are not so easy on the eye. 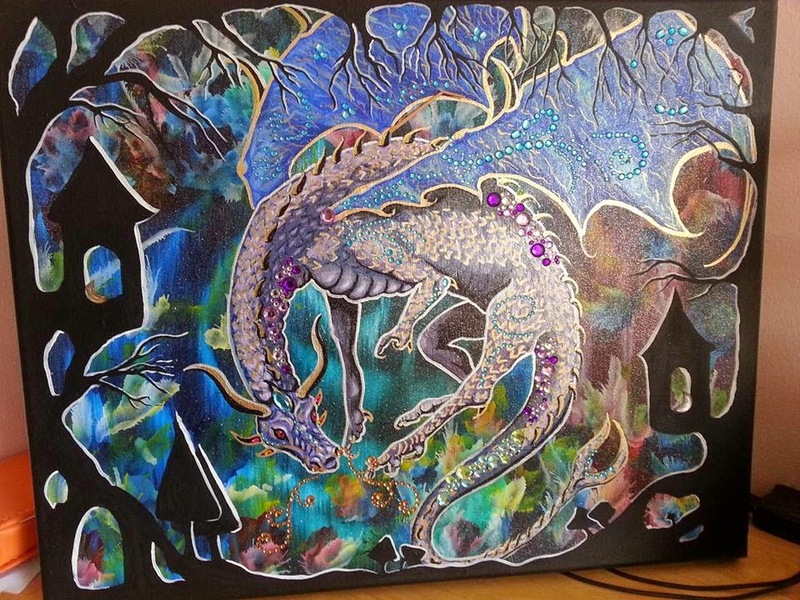 I have also been working some more on my Kaleidoscope Dragon. Painting is such a process. Several more layers of paint and several more still to do. He is taking a bit more shape though. My next task is to concentrate on his face. I need to get some fine details laid down. There will need to be a couple of glazes too. I don't know if I will add jewels to this one. It might be fun even though it is a pain in the arse to do. I shall wait and see how it looks when it is finished and has had the glazes etc applied. It might be enough without the jewels.....or I might want to sparkle it up a bit. 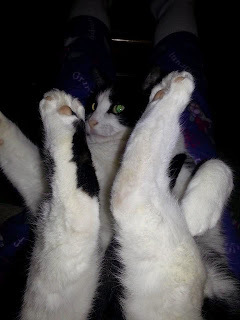 I have to show you this photo of Lily. She likes to squeeze into one of the cat beds, and we have plenty that are empty, with Tootsie. She always seems to think Tootsie will move and let her have the space to herself. Sadly, Tootsie couldn't give a hoot about Lily squeezing in and never does move out. Poor Lily doesn't look very gruntled. I am so tired of hearing about terrorism, disasters, wars, riots, racism, politics etc.......that it was lovely to hear something pleasant. 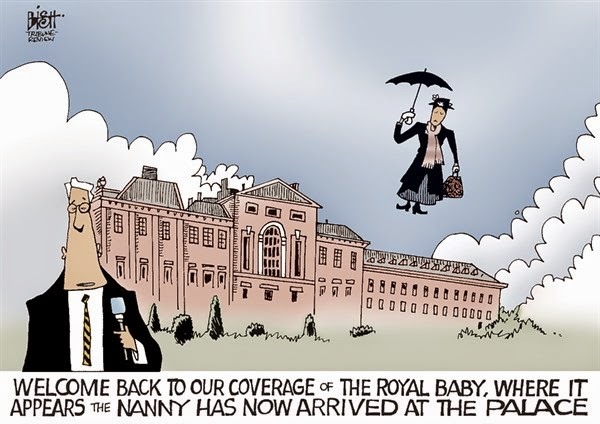 The royal baby has arrived safely. I don't claim to be a royalist at all but in these times of doom and gloom it lifted my spirits to hear about a new baby. William and Kate seem to be a lovely couple and it takes a hard heart to hear their good news without feeling pleased for them. They now have a smashing little boy and a gorgeous (saw the photos) baby girl. Bloody good luck to them. I did see a couple of miserable buggers complaining about the amount of news coverage. Well, bloody hard luck. I know lots of babies are born every day but a royal baby is not. I find joy in all the babies who are born healthy and safely. I know from experience that this is not always the case, but that doesn't stop me from sending congratulations to the royal baby and all the others too. The nay sayers can go back to watching the reports of massacres, politics etc, while the rest of us bask in this brief moment of happiness. Apart from that I have had a pretty crap weekend. I had an angina attack on Thursday and it was a nasty one. Philip was out golfing and I almost, almost thought about calling an ambulance. But, it passed and I just got one with things. Friday I expected to feel really awful. I usually do if I have had a bad one but I didn't feel too bad at all. I felt dreadful. The muscles in my back and chest are so painful that I got virtually no sleep Saturday night. Today, Sunday, I have felt really rough all day. This evening I am going to have a brandy or three.......actually two probably. It acts as a muscle relaxant so I am hoping it will help calm my back and rib muscles. I will also apply ibuprofen cream when I go to bed. I do hope that works. It will probably be another couple of days before I feel any real improvement. This afternoon, although I didn't really feel like it, we went to a neighbourhood get together. It was called an ice cream social. I had promised I would go so I didn't want to let anyone down. It was good to meet neighbours I hadn't spoken to before and found we had a lot in common with some. We will have to get more involved with this neighbourhood association now that Donna and Lauren will soon be here for a while. It will be a good way for Lauren to get to know some local kids. They do a lot of good stuff. Halloween is really popular event apparently. We didn't stay for the whole time as I was in quite a bit of pain but long enough to meet people. Thunderstorms due tonight. Sleep might still be out of the question then.